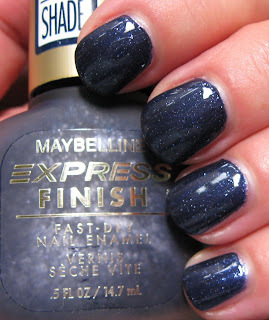 You can't have a week of old school polishes without including Maybelline! I have a massive amount of old Maybellines, and most of them I bought when they originally came out years ago. With the resurgence of them at many Dollar Trees over the last couple of years, I've managed to pick up some that I didn't have. My Friday Follower Freebie features some of these older Maybelline polishes, so if you'd like to enter that here, it's still open until midnight tonight. Above & Below: Plum Aluminum is more of a lavender shade than plum, and it has a somewhat metallic finish. I used 2 coats on this and other than it needing a little thinner, as most of these do at this point, it covers nicely. 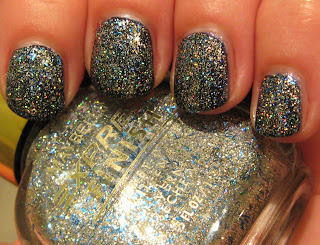 I've used a matte top coat over this in the past, and it resembles the finish of the OPI Suede polishes. Below: Purple Comet is a very grey-leaning lavender shade with tiny silver glitter pieces. It's shown with a flash in the first photo, and with no flash in the second shot. Below: Matte Sapphire is interesting for a matte shade because it has silver glitter in it. Most of my matte shades from the present era don't have this added feature. Again, this one is getting quite thick so it needs some thinner (I always realize this too late! ), but it covered nicely using 2 coats. While the finish is matte, it's not completely flat. Below: A clear top coat enhances this shade nicely. Below: Shooting Stars has much more pizazz than what I was able to capture in this indoor shot. I prefer to use this over a darker shade (Matte Sapphire in this case). 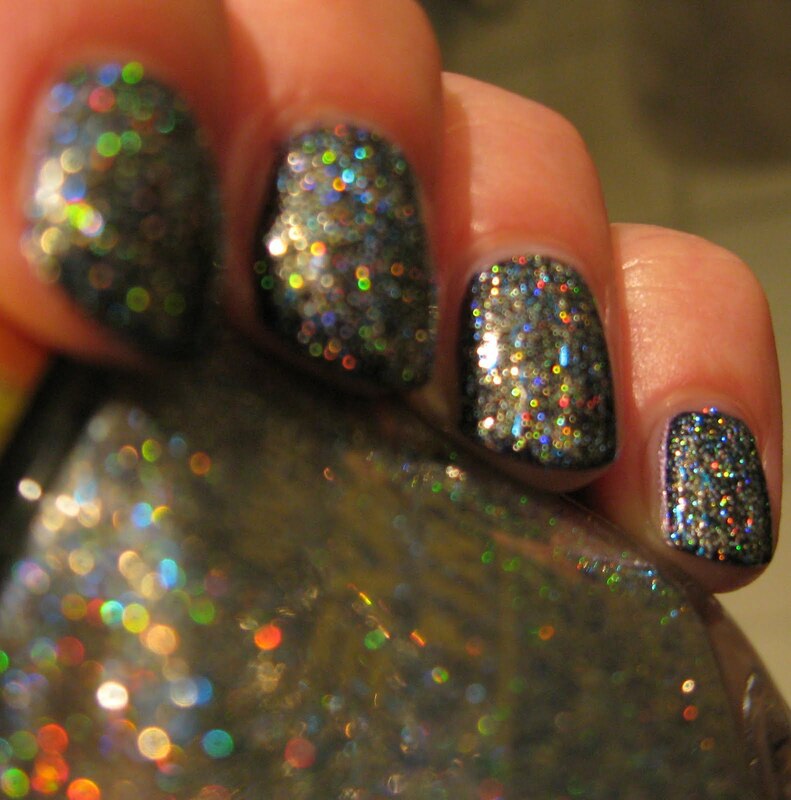 This multi-colored massive glitter shade also has a very slight holo effect. Below: This is why I adore Shooting Stars. I'll be doing more posts featuring older Maybelline shades later today or tomorrow, so if there are any particular ones you'd like to see, let me know and I'll be happy to include them if they're in my stash. I love suiting stars! Let me know if you ever run into a pile of them! I am trying to make quite a few people my blue star franken. Wow all of these are great! Shooting Stars iss just gorgeous! Omg the last two are AMAZING! Mary, I picked up a few of the old Maybelline's at my Dollar Tree too, but I left behind some of the "waters" ones. I'm curious, if you know, what are you supposed to do with those ones, are they mostly for layering? The ones I did get were the Denim Collection, frosty blues and purples. I've been finding some Maybelline's at the Dollar Tree. I have Red Comet. Wonder if it's from the same collection? Shooting Stars is a gorgeous top coat! I have matte sapphire and purple aluminum I found them both at the dollar depot of all places!